Angelo Pisano’s new book “Prison Guide: Survival Secrets Revealed” is an emotional, raw and telling work about the author’s experiences in prison. 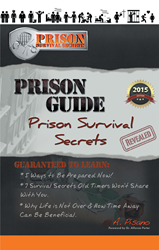 Recent release “Prison Guide: Survival Secrets Revealed” from Page Publishing author Angelo Pisano is a valuable resource, research, and reference for soon to be inmates and their families alike. Angelo Pisano, an entrepreneur, artist, prison veteran, consultant to soon-to-be inmates, youth activist, devoted writer and author, has completed his first book “Prison Guide: Survival Secrets Revealed”: a gripping and potent journey into the life of an inmate. “The situation is unfortunate, and there’s no getting around it. You don’t have to be helpless. You can be in control every single day,” said author Angelo Pisano. Published by New York City-based Page Publishing, Angelo Pisano’s tale aims to protect future convicts, encouraging them to spend their time wisely while behind bars, and ensure a successful return home as quickly and safely as possible. The secrets of surviving prison have remained unwritten – until now. Angelo Pisano, a ten-year veteran of the U.S. prison system, is breaking the silence with this guide on how to navigate a world behind bars. With a focus on getting home as soon as possible, Pisano prepares soon-to-be inmates for confinement, whether their sentences will be served in county jails or in maximum security prisons. The advice for so-called “new Jacks” covers all types of scenarios, from fights to the complex rules that govern borrowing and lending to the best practices at the gambling table. By teaching the newly convicted about the pecking order and how to stay out of trouble with correctional officers and inmates alike, Pisano aims to get his readers out of jail as early as the criminal justice system will allow. Instead of feeling helpless, Pisano’s readers will come away from the book feeling more in control. That’s because, as Pisano writes, being confined to jail doesn’t mean being confined to bad choices. Instead, he provides his readers with workable advice on how to take advantage of the solitude and freedom from distraction to improve character, intellect and chances for future success. By reading this book, the newly convicted just might be able to see the light at the end of the tunnel. Readers who wish to experience this profound work can purchase “Prison Guide: Survival Secrets Revealed” at bookstores everywhere, or online at the Apple iTunes store, Amazon, Google Play or Barnes and Noble.